The Siskel’s annual fest offers a wealth of options (and nations). The Siskel’s monthlong European Union Film Festival (Friday 2 through March 29) is always a daunting affair, in part because of its divided programming philosophy: With 65 local premieres and all 27 EU nations accounted for, you sense a tension between the obligation to be inclusive and the desire to be curatorial. Movies from regulars like Bruno Dumont (represented with the less-than-well-received Hors Satan, March 24 and 28) play opposite titles that have fallen through the cracks. One candidate for the latter category is Abdellatif Kechiche’s Black Venus (Saturday 3 and Tuesday 6), which didn’t get a fair shake stateside after its 2010 Venice premiere. Kechiche tells the true story of Saartjie “Sarah” Baartman (Yahima Torres), a black woman born in what is now South Africa. 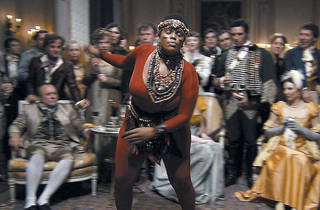 In the early 19th century, Baartman was exploited as a sideshow attraction in England and France. Shot in a handheld style that feels bracingly modern, Black Venus, like Public Enemies, confounds expectations of how period is supposed to look. 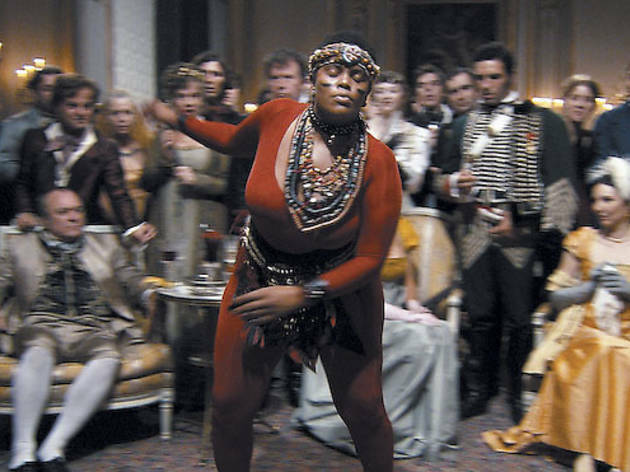 The film is a searing examination of racism, social constructs and agency, as Baartman is first received as a victim by British high society then later debased by its French equivalent. After having a hit at EU in 2010 with Dogtooth, Greece’s Yorgos Lanthimos returns with the disappointing Alps (March 24 and 26), which doesn’t wash either as allegory or black comedy. Told in a deadpan style, the film follows a secretive group whose members are hired to role-play as the recently deceased. Apparently this helps the bereaved cope with their losses, though it’s hard to see how having to coach a stranger on looking and acting like a dead loved one wouldn’t make the death more keenly felt. Or is that the point? Dreileben (March 10 through 14), from Germany, promises to be one of the festival’s major events. A trilogy centered around a killer on the loose, the triptych consists of three 90-minute films shot by different directors in contrasting visual styles. Opinion varies on which installment is best, but I’d say Christian Petzold’s Beats Being Dead—in which a taciturn hospital intern finds himself torn between two women—is the one that stands alone. If you’re expecting answers, be advised that the other two parts obfuscate as much as they reveal. In terms of documentaries, Putin’s Kiss (March 10 and 15) is a draggy but potent critique that shows how a pretty rising journalist, born in 1989, becomes a cog in Putin’s allies’ propaganda machine, which is as far-reaching and paranoia-inducing as its Soviet equivalent. The best example of old-fashioned craftsmanship is Terence Davies’s The Deep Blue Sea (March 13), an adaptation of Terence Rattigan’s play (previously filmed in 1955 with Vivien Leigh). Rachel Weisz stars as a woman whose fling with an RAF pilot (Tom Hiddleston) leaves her torn between her new beau and her wealthy, much older husband (Simon Russell Beale). This isn’t a great play, but its concerns dovetail well with Davies’s autobiographical films (Distant Voices, Still Lives; The Long Day Closes). Here, as there, the focus is on Catholic guilt, the difficulty of reconciling social constraints and physical passion, and classical artistry. A callback to the heyday of British cinema—and gorgeously scored to Samuel Barber—it makes even its most perfunctory exchanges seem like matters of life and death. The 15th Annual European Union Film Festival shows from Friday 2 through March 29.